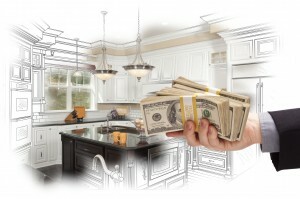 Everyone wants to know: how much does the average kitchen remodel cost and how can I remodel my kitchen for less? As of 2014, Houzz’s House and Home survey tallied an average of $25,000 for kitchen renovations. The survey included those that hired a professional as well as those that went the DIY route. So what does that mean for the 22% of Americans that plan to remodel their kitchen in the near future? For starters, the average isn’t as telling as you might think. The average is simply the midpoint between the highest price people pay and the lowest, and this survey in particular included expansive remodeling projects as well as small DIY additions. In other words, don’t let the numbers scare you away. There are so many ways you can cut costs and remodel your kitchen on a tight budget. Although, if you’re not looking to cut corners, buy wholesale materials, or add some DIY efforts, you will likely be paying more than these average costs. According to top kitchen designers, the average numbers produced by the latest Houzz House and Home survey are a bit on the low side. Saving money on your kitchen remodel isn’t only important in order to stay on budget; it also makes more sense financially. Lower budget kitchen remodeling projects regularly recoup more money when the home is sold than big budget remodels that only make back a fraction of their original cost. Regardless of how much you spend, a remodeled kitchen still earns the biggest return on investment compared to any other home renovation. Here is a breakdown of the most important elements of any kitchen remodel including how much people spend on average and how you can cut costs. How Much Do Kitchen Cabinets Cost On Average? Kitchen cabinets are the most expensive materials you will purchase for your remodel, making up about 40% of your total remodeling budget. They make a huge impact on the style and functionality of your kitchen, and so it makes sense that they cost a lot. They will also last longer than most other elements of your kitchen. Of course, the best way to save money your kitchen cabinets is to buy wholesale from Tops Kitchen Cabinet. Measure your kitchen and plan to install cabinets in a compact work area using standard sized cabinets. Buy stock cabinets and avoid costly personalization that comes with semi-custom or custom cabinetry. Mix and match custom with semi-custom or stock kitchen cabinets in order to save money and still give off a high-end look. Go with less expensive materials and skip out on the name brands. How Much Do Kitchen Appliances Cost On Average? Don’t go with the latest technology or name brands, all of these things are just going to add more money onto your final bill. Unless a kitchen fridge with apps is really important to you it’s only going to break the bank. Simply carry your phone with you when you go to the fridge if you really need to check the weather while grabbing a snack. Go with energy efficient options so that your electric bill is less and you save money over time. Remember, energy efficient appliances are more important than anything else. Keep kitchen appliances where they are. If you start to move around major appliances your remodeling costs are going to skyrocket because you may need to hire an electrician or plumber. How Much Do Kitchen Countertops Cost On Average? Your kitchen countertops are another big expense that can cost anywhere between $900 to around $7,100. That’s a big spread, which just goes to show how much flexibility you have when picking out countertops that fit your budget. There are many different factors that determine how much your countertops cost, the biggest influencers are the size space you need to cover as well as the type of materials used. Laminate countertops, for instance, are about as affordable as you can get but won’t stand up to wear and tear the same way as granite, or other types of high end countertops. You can save a lot of money on countertops by simply buying wholesale from us. We carry a huge assortment of granite. When you get a great price on granite you can use leftover materials from your order to create a backsplash or other detail elements throughout the kitchen. This may actually cost less than sourcing new materials. The thickness of your countertop as well as the type of edge detailing you opt for will also greatly influence cost. Granite and marble are more expensive when edge detailing is called for. If you’re trying to save money simple round or square corners are your best bet. Use granite or other high end materials on parts of your kitchen but use something else, like concrete, tile, recycled products, or a butcher’s block on other parts of your kitchen. This diversity creates a cool pop, plus you save money and still get high-end countertops. Laminate countertops are the most affordable option, as mentioned above, and this material comes in all different styles. It can be made to imitate the look of stone, granite and other high-end materials. How Much Does The Kitchen Sink + Faucet Cost On Average? The cost to install a kitchen sink is between $500 and $2,700, and that doesn’t include the faucet, which will run you around $130 to $630 + per faucet. No doubt the kitchen sink is an important component of your kitchen, in fact you will likely spend a good deal of your time in the kitchen at the sink. Make sure your sink is deep enough so that it is easy to clean big pots and pans; yet you don’t necessarily need the fanciest sink basin materials since this is where everyone tosses their dirty dishes anyway. We sell faucets at wholesale prices, so right away you can save money. The shape and materials you use on your sink will greatly impact cost. Keep the sink where it is so you don’t have to pay for plumbing costs to move it. Find recycled materials for the sink basin; this can look really cool and save you a pretty penny. Just make sure to consider the cost of installation first, if the sink is very unique it might cost more to install than you’ll ever save. How Much Does It Cost To Install Kitchen Flooring On Average? The national average cost for installing new kitchen floors ranges between a modest $700 and $3,900, of course flooring costs can reach much higher than this once you factor in how much the actual floors cost and how much space you have to cover. Use repurposed materials for flooring. This can look really cool and work as a standout feature in your kitchen, plus you can score awesome flooring materials for cheap or even nothing at all. Don’t be afraid to negotiate the price of installation with floor installers. It may or may not work, but you have nothing to lose by simply asking for a discount. Instead of installing new floors use a stain or sealer to give your floor a unique look for much less. Once you recover from the rest of your renovation expenses you can turn to the floors. The first step to planning any kitchen remodel is to make sure you have a budget you are comfortable with. Start by writing down everything you want to do to your kitchen with a price estimate for each detail. Total everything up and see where you are at, then go from here chopping off things you don’t want or need as much until you get closer to your goal budget. Always remember to factor in around 20% for unexpected expenses, because they are likely to arise and it’s better to be prepared than caught of guard, and say for instance unable to complete renovations. Consider if there are any DIY projects you can do to help improve the look of your kitchen without spending a fortune. Once you’ve got your budget set it is time to find wholesalers and contractors to purchase from and hire. Since you know exactly how much you want to spend on each element you are prepared to ask for prices and pick accordingly. Tops Kitchen Cabinet is here to help you save money on your next kitchen remodel by offering the latest styles in kitchen cabinets, countertops and accessories at wholesale prices.